My Lady, I call out to you like a child in the night, who wakes from her shallow dreams of fickle sunlight to find the world in darkness. Saraswati Maa! I cry for you to come and peel away these clouds that cover the moon in my heart, so that I may better bear your light into this suffering world. 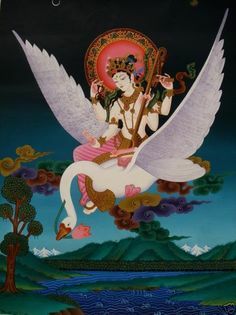 Bless me, My Lady Saraswati, to never be satisfied unless I have the crystal light of the moon on your brow to be my guide as the silver starry spark within the lamp that lights my way on this darkened path to liberation from the burning house called Samsara. My heart was a vessel brimming with love that burned my skin and broke my soul. All my life I waited for Someone to take this cup from within me and drink from it, so I that I would know release. You, My Lady, have taken the cup from me and emptied it to the last drop. And then You filled it again. Reblogging for an awesome project and an awesome person. I have concluded that the baby quilt project requires too much time, effort, and energy for one person. There’s a need beyond the hospitals around my front door, and I can’t do it alone. I’ve created a Facebook page for others to join in the project, whether it’s making quilts, knitting or crocheting preemie caps, sewing burial gowns for the babies who don’t make it, or just lending moral support to people who do. My hope is that we’ll be able to make something happen well beyond my own community, as I’m wanting volunteers to make items for their own local hospitals. The Brighid’s Babies Project page is live on Facebook now, and if you’re interested in taking part, I would love to hear from you! Shinies! I made them. They are my shinies. There are many shinies, but these are mine.